Oktoberfest Side Trip - Santis Deli ~ Philippine Freebies, Promos, Contests and MORE! If your a fan of German Sausage and German Cold Cuts, then make your purchases at any of the Santis Delicatessen branches. 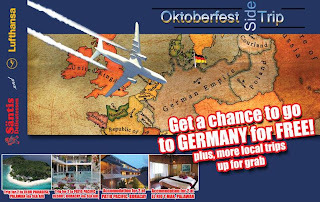 Not only do you get quality products, you also stand a chance to Win a Trip to Germany, Palawan, Boracay, and more with Oktoberfest Side Trip! Total of 5 trip winners and 5 Wrist watch winners. It's sandwich time baby! Customer must write legibly his/her complete name, address with zip code, telephone numbers and affix signature on the entry stubs of the raffle coupon and drop it in the designated drop boxes located at all Santis Delis nationwide.